The family of Abdulraaheed Maina, the embattled former chairman of the Presidential Pension Reform Task Team, has promised to expose the cabal at the presidency who they alleged are responsible for the ordeal Maina is going through over his return to the civil service. Addressing the media Wednesday in Kaduna, spokesman of the Maina family, Malam Aliyu Maina, who was flanked by Salihu Maina and Ladan Abdullahi, said the family is worried that the image of the entire family has been tarnished following the sealing of properties belonging to the Maina by the Economic and Financial Crimes Commission (EFCC) and promised to take legal action on it. They said that Abdulrasheed left Nigeria following threats to his life, only for President Muhammadu Buhari to invite him to come and help his administration. 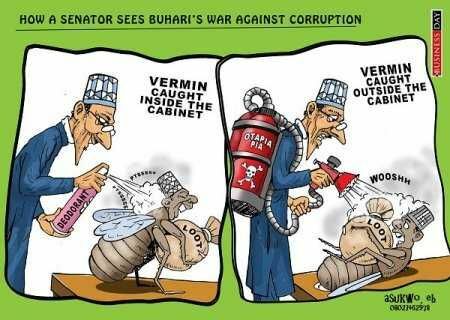 "You must have noticed the recent attempt by some cabal to ridicule and tarnish the image of the Maina family in the media. Where our brother, Abdulrasheed Maina has been blackmailed as a fraudster. "The cabals have gone to the extent of marking our house in red paints with an inscription of E.F.C.C under investigation. The EFCC is wrong in their action because Abdulrasheed inherited so many properties from his late father in Kaduna and Abuja, some of them were built before he was born so how could he have acquired them fraudulently. "The entire family of Abdullahi Maina is categorically stating that our son is not in any way a fraudster, rather he is a messiah who brought reforms into Nigerian Pension Scheme, whose effort saw the disappearance of pensioners roaming the streets of Abuja and other state capital in Nigeria. "It is on record that Abdulrasheed Maina's reform put to a stop the fraudulent withdrawals of huge sums from both the Nigerian Pension Board, the Nigerian Police Pension Board etc. Perhaps it is this noble efforts that made him enviable to the present administration when they came into power to convince him to comeback and assist in its "Change" agenda." According to the family, the recent actions may have been targeted at not Maina but high above, "we are aware that all this act of calumny is not targeted against Abdulrasheed Maina alone but against the President of Federal Republic of Nigeria and the office of the Attorney General. We have contacted our lawyers Messr Mamma Nasir & Co and instructed them to act appropriately. "We equally know that Abdulrasheed Maina is in possession of many facts that is against the cabal and interesting to the Nigerian populace, which he will disclose very soon," the family noted.